The Maori culture, which is the culture of the first people who settled in New Zealand, is a fascinating culture that you’ll just want to learn more and more about once you discover it in New Zealand. Each Ta Moko (Māori Tattoo) is incredibly unique, communicating tribal messages from ancestors around things like family, tribal affiliations and the wearer’s social standing. Moko is a type of visual language connecting the wearer to their family tree. Often, Ta Moko was applied to the face; because the head is seen as the most sacred part of the body, to wear Ta Moko on the face is a very strong declaration of who you are as a Māori. Traditionally, Māori would use chisels and knives made from sharpened shark teeth, and ink made from burnt wood, gum or other natural products. The traditional art of tattooing is unique on each individual because they show that person’s genealogy, knowledge and social status with their tribe (or “iwiw”). “Moko” was originally done with pigment on the end of a sharp bone hit into the skin. However, nowadays, most people opt for more modern methods of tattooing. Before the European settlers arrived in New Zealand, there was no written language for Maori, otherwise known as Te reo Maori. Instead, history was also taught orally through stories or depicted in carvings. That’s why the Maori are among some of the most incredible story-tellers you’ll ever meet. If there’s one thing you know about the Maori culture, it’s probably the Haka. This compelling chant seen at the beginning of the New Zealand rugby games is often believed to be a war dance. While it was sometimes used for that purpose, there are actually many types of Haka used for different occasions, from funerals to motivation for the tribe. The Haka has a fascinating history in itself, which you can learn more about in The Maori Haka: Its Meaning & History. 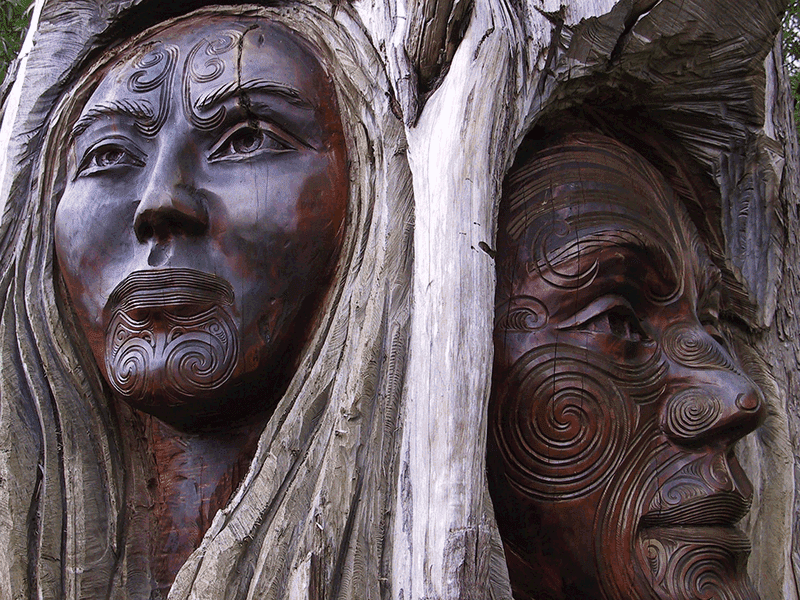 The first Maori arrived in New Zealand in the 1300s. It’s not 100% certain where the Maori originally came from, but it is said that the Maori culture as we know it was developed during these first voyages in New Zealand. As this was only around 700 years ago, this makes the Maori culture one of the youngest in the world. One of the most traditional and most favored meals in the Maori culture is something called a Hangi. This is meat and vegetables slow-cooked underground. The Hangi (not to be confused with the Hongi!) is a feast cooked within an earth oven for several hours. The locals heat stones in the embers of a fire and dig a pit where the hot stones are placed along with wet sacking. Then, they place the food on top – think chicken, lamb, pork, and vegetables – before covering it with earth to trap the heat. The Hangi is an awesome way to feed a large group of people, and the smoky, earthy fragrance of the food is delicious. It’s quite different from your typical summer BBQ! There are lots of opportunities to try a Hangi, especially in Rotorua which has most of the Maori tourism experience. The greeting in Maori is called a Hongi. This is when two people press their foreheads and noses briefly together, closing their eyes and breathe deeply. This is representing sharing the “breath of life” where souls are meeting. Mostly found on the West Coast of the South Island, greenstone or jade is a precious stone to the Maori people. It’s known as “pounamu” in te reo Maori and is highly valuable. While greenstone has been used for weapons, ornaments, and tools, you’ll mostly see it carved into pendants symbolizing particular meanings. A Maori meeting ground is called a Marae. To be welcomed onto the Marae, you must first be welcomed through a powhiri. This usually involves a challenge by a Maori warrior, singing, chanting and you must show that you come in peace. It’s not as scary as it sounds, in fact, we say it’s one of the must-do Maori experiences in New Zealand. Prepare for it by checking out Maori Etiquette. A pa site is an old Maori fortified village. They were usually based on hills with terraces dug into the sides and surrounded by high fences. Many of the Maori people will know where their ancestors’ pa sites were but usually not much remains other than the terraces. However, some Maori tourism groups have remade villages, particularly in Rotorua and Gisborne, to give people an idea of what they used to look like. In Maori culture, the people are guided by two main beliefs: Manaakitanga and Kaitiakitanga. Manaakitanga, which values hospitality, is all about teaching the Maori people to treat visitors and guests with an abundance of kindness and have mutual respect for their beliefs. Kaitiakitanga, which values guardianship teaches the philosophy of caring for the natural world. Maori people take the responsibility of caring for and protecting their land very seriously. Like we said before, the Maori are the best storytellers. Maori have legends about most mountains, rivers, lakes and other important landmarks across New Zealand. Even the wildlife and Greenstone have legends on how they came to be. Most Maori legends are usually told to teach certain lessons to children.